Thirty Things: Do a Headstand (unassisted) – first attempt! | Viva La Vida! Thirty Things: Do a Headstand (unassisted) – first attempt! We had a fun Flying Fitness session with Paulo this evening! Since all of us were his regular students, he just made it an inversion workshop and taught us all, especially the Chua girls how to headstand. And since we had a pictorial session, I was able to keep the headstand up for a few seconds, just enough to take a picture unassisted. 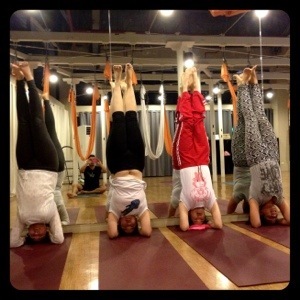 This entry was posted in Thirty Things and tagged headstand, thirty things, yoga by Roxanne Calingo. Bookmark the permalink.